Austrian barley of the finest quality, with selected hops from the traditional, renowned growing areas is the base for this delicately bitter brew. Well balanced. 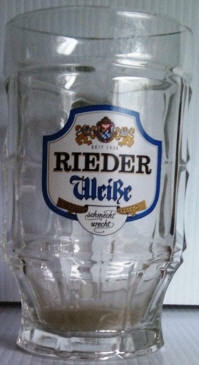 An unmistakable Pils experience provided by Rieder. The Innviertel is an upland region of fertile and well-cultivated land lying to the south of a line from Passau to Linz, bounded on the north by the Danube, on the west by the rivers Inn and Salzach, and on the south by the Hausruckwald. The area is studded with small villages and hamlets, farms and churches, in a style reminiscent of Bavaria; and in fact the Innviertel formed part of Bavaria until 1779 and again from 1809 to 1814. In addition to cattle rearing the region is noted for its hop growing. Politically the Innviertel (officially Innkreis) is divided into the districts of Branau, Ried and Schärding. The name of the city is derived from the Middle High German "Riet" which denotes the reed which grows along the shores of swamps. Pale golden body with the slightest haze, a bit rustic looking. The head is lasting and dense. Herbal, grassy, spicy hop aroma, light pils malt sweetness. This smells quite good. Herbal, spicy hop flavors over a clean and light pilsner malt foundation. Very flavorful, dry and quite bitter. Clean and crisp. A surprisingly excellent pils.